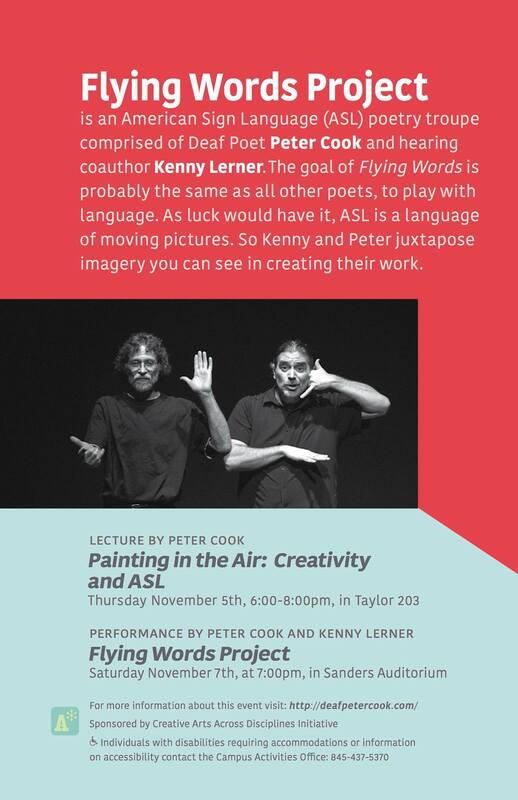 On Saturday, November 7, at 7:00pm, Cook and his Flying Words Project hearing collaborator and coauthor Kenny Lerner will perform in the Sanders Classroom Building, Spitzer Auditorium (room 212). The Flying Words Project has been performing for nearly thirty years. Cook and Lerner first write their poems in ASL and then decide how to voice them. “We figure out how to express just enough words and sounds so that hearing members in the audience can see the images for themselves,” Cook explains. Cook has traveled extensively around the country and abroad with the Flying Words Project to promote ASL literature. An associate professor of ASL-English interpretation at Chicago’s Columbia College, Cook has been featured in festivals such as the Jonesboro National Storytelling Festival , Oklahoma City Winter Tales, Illinois Storytelling Festival, Indiana Hoosier Storytelling Festival, Eugene Oregon Multi-Cultural Festival, The Deaf Way II and the Millennium Stage at the Kennedy Center in Washington, D.C. He was also featured in the film United States of Poetry. Critical study about the Flying Words Project has appeared in the journals, Literature and Medicine and The Tactile Mind. Cook and the Flying Words Project’s appearances are sponsored by the Creative Arts Across Disciplines Initiative at Vassar, which is generously funded by a grant from the Andrew W. Mellon Foundation.